When we dine at South St. Burger, we choose their soy based veggie burger patties. 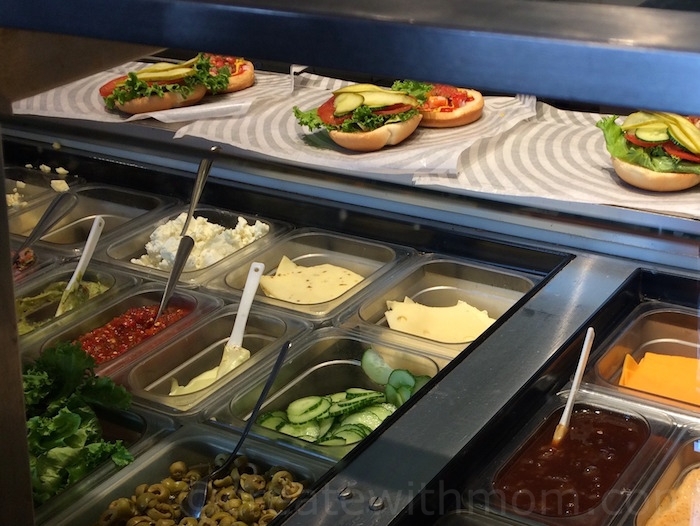 I like that we have the option to choose from about 30 traditional and gourmet condiments that includes Cajun onions, salsa, guacamole, mango chutney, different types of mayo, sauces and many more. There is an extra cost for their premium toppings such as grilled ginger glazed pineapple, sautéed mushrooms and the five different cheese options. We usually experiment a few different combinations, and enjoy the flavours that the toppings add to the burger. Their burger patties are flame grilled and made to order, it doesn't have MSG, preservatives or artificial ingredients. We can choose either regular, whole wheat or gluten free bun. For the burger patties they have the option of getting 4oz or 6oz beef patties made from 100% Angus beef raised without antibiotics or hormones and prepared without preservatives or additives. They also have grilled chicken breast, Oktoberfest sausages and all beef hot dogs on the menu. 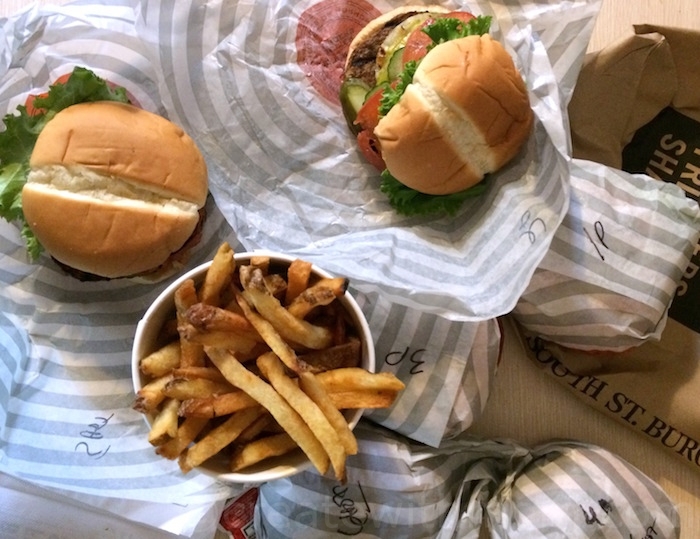 The hand cut fries are delicious and goes well with the burgers. They also have delicious milkshakes made with two scoops of real ice cream. 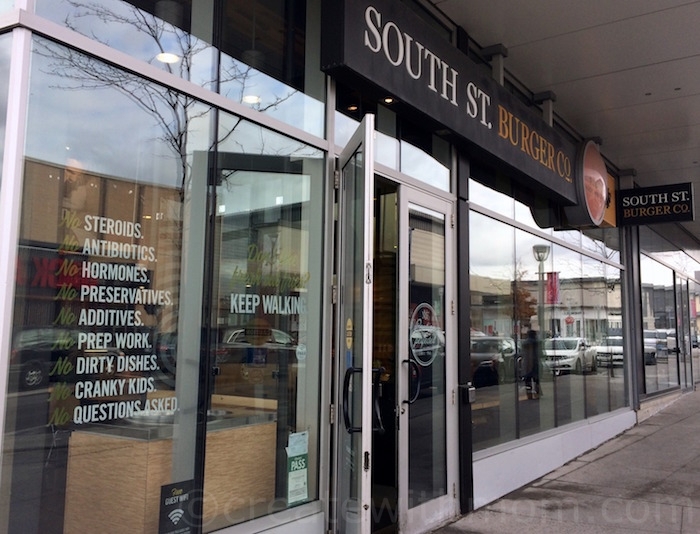 We like that we don't have to compromise taste and eating well, when we are on a busy schedule when dining at South St. Burger, a Canadian owned and operated company. There are more than 35 locations across Canada and two locations in Dubai. this place reminds me of Harveys which is my favorite. I must try it. Wish I could afford to eat out. I've heard about it but never tried it! One just opened up near me so I can't wait to go try it. not sure if we have one close by..sure looks good. Family would love it! i dont think theres any close to newfoundland! Love the choice of toppings! This looks delicious. I haven't tried it but love the selection of toppings! We don't have a South St. Burger here, but I keep reading great reviews on them. I have not been yet to a Southstreet Burger restaurant. I would love to though, I love a good burger. I haven't been here. Love the portion sizes. I would be interested in trying this place out! Oooh look at all those toppings! What a cool sounding place! Unfortunately nothing in my province! I know I've seen a location or two around my city but have never tried out this restaurant. Now that I know how much variety they offer, I will be stopping by for sure. Sounds like an amazing place, too bad we don't have any here.